Offering you a complete choice of products which include all in one diabetic foot lab. 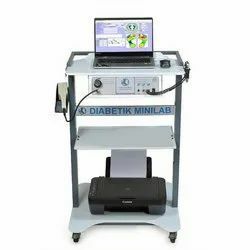 All in One Complete Diabetic Foot Lab model Diabetik Minilab. It is a combination of Vascular Doppler Recorder, Digital Biothesiometer, Medical Monofilament 10gm, Plantar Pressure Footscan Podiascan and IR non-contact Foot Thermometer. The unit is connected with any Windows-operated computer for patient data storage and report generation. 6 page report is generated and a master report in it has all the patient's medical, physical, clinical and medical data along with the actual test result of all the tests. Interpretation for all the tests is listed in the Master Report. Packaging Details: Trolley packed separately and the main unit is packed separately. Looking for All In One Diabetic Foot Lab ?